Airport travel is a hassle and your time matters. Cut out the wait for your Uber with the TranSit app. It's always the same struggle with airport traveling. So much time is lost between getting off your flight and catching your ride at the pickup area. We want to streamline the process and save you the extra time. The app sends a push notification when your flight has landed. The user has the option to book their Uber from their current terminal. It also shows the user's travel itinerary upon login. 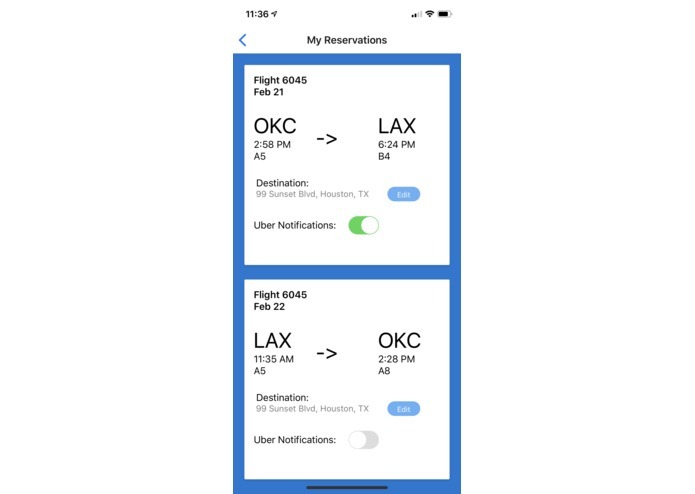 We used react-native to develop the iOS app and display users' booked flights. We also used node.js to handle push notifications and to manage reservations in the database. The primary challenge was to send push notifications to the app regardless of whether it was running or not. We also had difficulty running the flight landing process on the node server and propagating changes in the database. We are proud of meshing several different technologies together and ensuring that client-server communication is seamless. We learned about asynchronous processing and passing notifications to a mobile app. We were exposed to MongoDB and learned about querying and updating a database. Cleaning up the database and incorporating more information about a users reservations to create a more powerful experience. We would also like to add an authentication process and compatibility with other ride-hailing apps.